The Texwipe SolvSat™Canister System is a controlled delivery system for pre-wetted wipers that deliver the right amount of solvent to manual cleaning operations. The pouch within a canister delivery system is designed for ease of use in a production environment and can be easily carried to the work station. Each pouch contains a perforated roll of nonwoven wipers saturated with Acetone and packaged in a solvent-resistant pouch that fits easily into a canister where wipes are threaded through a molded opening designed to allow users to tear off wipes at their perforation for single wipe use. 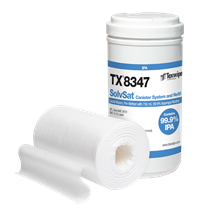 The Texwipe SolvSat Canister system is designed for manual cleaning applications and replaces squirt bottles, wipers, shop rags. By utilizing pre-wetted wipers, worker exposure to hazardous vapors is minimized, VOC emissions are lowered and the potential for spills is eliminated.